According to folklore, the tides in the Bay of Fundy are caused by a giant whale splashing in the water. Oceanographers attribute these same phenomena to tidal resonance. A cosmic coincidence. The time it takes a big wave to travel the length of the Bay of Fundy including the return trip to its mouth is more or less equal in duration to the lunar tide. The combined effect of time and tide being the Bay of Fundy has some of the most dramatic differences between high and low tides on the planet. From NASA's website, "this coincidence means that the general sloshing of the water around the bay can become synchronized with the lunar tides, amplifying their effect." The Yamamoto Audio Bases are mostly made from various tone woods or let's say, woods that are also used to make musical instruments. You could surmise that since woods like ebony and cherry are used in the construction of musical instruments for their specific acoustic properties, using these same materials in audio equipment bases just might leverage these properties -- namely their resonant frequencies -- for the good of your gear. While you'd get little argument from any camp that a rosewood-backed acoustic guitar will sound different from a Koa-backed guitar, I can understand the skepticism when attempting to translate these properties into little wooden feet that sit under your gear. My formal position on this topic is that changing what your gear sits on can change its sound; sometimes for the better, sometimes for the worse and sometimes not at all. And further, the most important aspect of this potential for change is how it makes your music sound. If you're interested in what forces may be at work and how the Yamamoto Audio bases interact with them, you'll have to look elsewhere for non-experiential observations. That's not to say I haven't speculated. I suspect there's a giant whale in the mix. If you haven't read Jeff Day's and Srajan's reviews of the Yamamoto A08 and A08-S amplifiers, you should check them out. Yamamoto Sound Craft is a fascinating company and one of a few that makes nearly a complete line of gear. This includes amplifiers, preamps, speakers, power strips, wooden head shells, equipment racks, audio bases and various parts including ebony-encased capacitors and their revered Yamamoto ceramic tube sockets. If you look throughout the Yamamoto line, you'll see superb build quality, attention to detail and lots of tone wood. Yamamoto makes over twenty-five different types of Setting Bases. While the majority of bases are made from wood, the line also includes ceramic, bronze, rubber, felt and deer skin. The GS-7 which is one of the deer skin products is a form of tape meant for winding around cables while the GS-6s are little deer skin spacers meant to be stuck under your gear's metal feet. Thankfully, today's review will focus on three varieties of wooden bases and the new MGB-1 magnetic base. When laid out on my desk, the Yamamoto footers reminded me of an operating room, the various tools lying in wait for their various jobs. Sonic scalpels? is when using one of the cup-type devices under spikes. 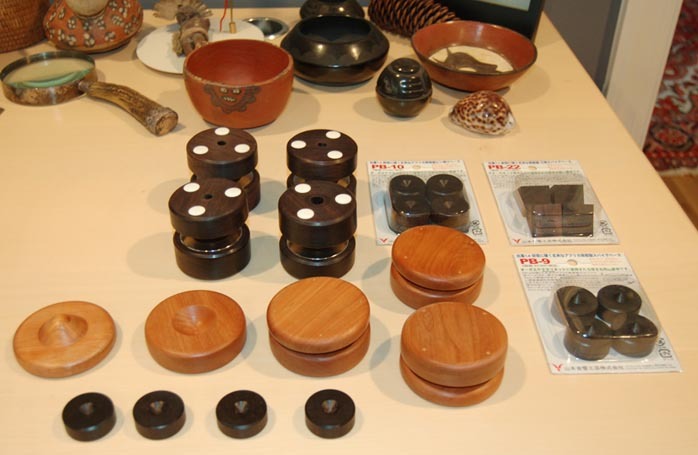 The PB-9 and PB-10 bases are made of African ebony and are 1 ¼" in diameter and their main body is ½" high. The PB-9s have a point and the PB-10s a cup. When used together, their combined height is 1". The combination can be used as equipment footer and the PB-10 can be used solo under spikes (equipment or speakers). The triangular-shaped PB-22s are cut from Southeast Asian ebony and stand 1 ½" x 1" x 1" and the larger PB-16s (2 5/8" diameter by 1¼" combined height) are Japanese cherry wood. 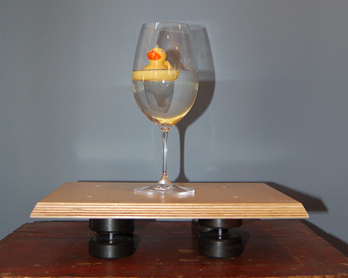 The more complex and interesting MGB-1 magnetic base is a slightly different animal from our wooden bases. The MGB-1 adds the claim of isolation from floor-born resonance to the mix. The MGB-1s are made from African Blackwood, ceramic spacers, a bolt riding inside a Teflon tube and two small "ring type Neozium magnets". The basic premise at work is the magnet's opposing poles keep the bottom and top African Blackwood pieces 'floating' on a magnetic wave and the bolt keeps the two halves together. Since the bolt remains in contact with the Teflon tube which in turn is in contact with the Blackwood top and bottom, we are not talking pure magnetic levitation. And while the concept of using magnets to isolate is not a new idea -- the SAP Relaxa line comes to mind as well as the Clearaudio Magix feet -- it's still an intriguing approach and the combination of magnet and African Blackwood (used in oboe bodies) is a new twist as far as I know. I've been using the PB-10s on my Cain & Cain Abbys for nearly 2 years. Initially I was looking for a cost-effective solution to protect my wood floors from the Abbys spikes. The least expensive solution which oddly enough turned out to be currency -- eight shiny pennies -- served this purpose but actually didn't work out for a number of reasons. With Lincoln's flattened profile providing the resting place for the Abby's spikes, any minor adjustment meant one or more of the pennies slipped from their spots and re-positioning became a real drag. I came across the Yamamoto footers on the Venus HiFi website and for $35 for four ebony footers, I thought it was worth a try. I've heard a number of positive reports on the effects of ebony including its use in Herbies tube dampers and Mpingo devices so I ordered two pair from Brian Bowdle, the US importer of the Yamamoto line. When the PB-10s arrived, I placed them under the Abbys and there they've remained for these past 2 years. Why? Beyond the fact that they make positioning a breeze, protect my floors and stay put, I prefer the sound of the Abbys with the ebony footers. Compared to the pennies (nickels, dimes and quarters too) the PB-10 ebony imparts a tighter, fuller bottom end, improved resolution and I'd even go as far as saying the African ebony gives the Abbys a richer tonal flavor. I also prefer the PB-10s to the Abbys spikes going directly into my wood floors. So does my wife. The Audio Aero comes with Black Diamond Racing cone footers built in. I always found these footers to drain some of the energy from the player so I've used the Symposium Rollerblock IIs for the past few years. The only issue with the Rollerblocks is their height. It meant a slight jury-rig setup because they're not as tall as the Racing cones. The MGB-1s suffer no such shortfall and I used three of them under the Audio Aero following Brian Bowdle's recommendation. The changes imparted are at once immediately recognizable and to my ears all positive. Bass energy is increased, tighter and the noise floor is reduced. There's more air and space to recordings which translates to a more natural presentation. 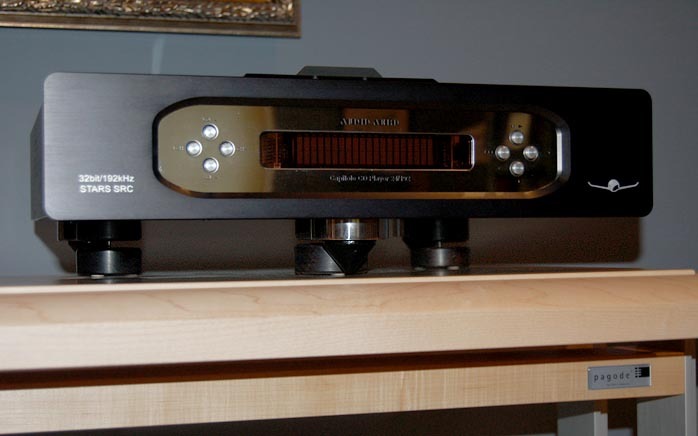 Even though my Audio Aero sits atop the very fine Finite Elemente Pagoda Master Reference rack, its performance is further enhanced by the Yamamoto MGB-1 footers. While the Pagoda rack does a fine job in the isolation department, I'd have to surmise that the Black Diamond Racing cone footers impart a sonic flavor that I don't favor. I also tried the PB-10 bases directly under the cones and I prefer this solution as well. Again bass is tighter, although not to the same extent as the MGB-1s and there's a tonal shift toward a fatter sound. Compared to the Rollerblocks, the Yamamoto MGB-1s provide a more tonally rich sound; the Rollerblocks pulling out more detail and resolution, the Yamamoto's providing more weight and perhaps slightly less ultimate detail. For my tastes, I'd give the nod to the Yamamotos, favoring body and tone to increased resolution. Under the Rega P3, the MGB-1s also imparted greater resolution and focus. This coupled with more "air" made for a more natural and pleasing presentation. Due to the Rega's weight distribution, I found 4 of the MGB-1s worked best and my only quibble with this setup is the turntable becomes very sensitive to the human touch - lifting the lid caused the record to skip unless I was gentle and careful. Overall, I'd characterize the results with the MGB-1s under my source components as the most dramatic improvements to be had with all footers under all my gear. Because of its unique shape, the Fi Yph does not lend itself to your typical footer but three triangular PB-22s standing on point offered a stable platform. Thus situated, I could not discern any change in the sound for better or worse. I also tried the PB-16s with similar (non) results. The Fi 421A has a flat bottom, which made for easier placement of the PB9/10, PB-22 and PB-16s. I also tried all the various footers under my Fi 45 which has an open bottom, making placement a tad precarious under the vertical end pieces. In all cases I found a subtle but negative sonic effect; bass impact and weight was reduced and there was a distinct blurring of detail. Overall I'd describe the effect as a softening of the sound which to my ears was not welcome. I suspect some gear like the Fis is adequately tuned and any attempt at addition results in sonic subtraction. How do you know if your gear is foot-worthy? My experience tells me it's a trial & error kinda deal. There's no substitute for experience. This applies doubly to system enhancement devices like audio bases. And alcohol. On the other hand, the Déjà Vu Audio preamplifier reacted positively to all footers. I'd speculate that was due in part to the microphonic nature of the trio of 6SN7s employed and a relatively lively metal box-style chassis which mean the Déjà Vu can have a touch of glare. The cherry PB-16s softened this glare but there was no blurring and no loss of detail or resolution as I experienced with my Fi amplifiers. The ebony footers had a similar effect only they held onto a bit more of that edge and associated glare. 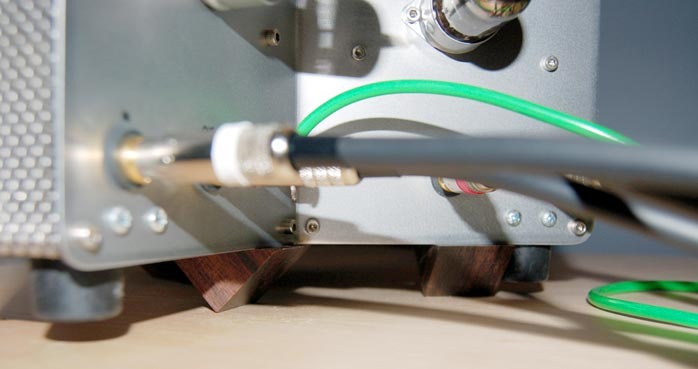 I'd like to suggest that owners of tube gear with similar lively box-style chassis may also hear some sonic benefit to shifting resonant properties with some tone wood bases. I discussed this theory with Brian Bowdle and he does report his own positive results along with some satisfied Yamamoto clients, particularly those who've tried the ebony bases under the Yamamoto preamps. And there's also the danger of difference in and of itself. The ability to change your systems sound can sound revelatory - at first. Exerting influence, master-of-your-domain stuff. But sometimes difference isn't better, it's just different. And the only cure for this short-sightedness is time spent listening. I found the Yamamoto footers to have varied effects from good to bad to indifferent depending on the specific gear. The MGB-1 magnetic bases under the Audio Aero CD player and Rega P3 turntable netted real sonic gains and they were not subtle. I also found the PB-10s to have positive effects when used directly under the Audio Aero's included feet. While this is not their preferred method of use, Yamamoto suggests coming into contact with the component's chassis, there were still positive gains to be had. Yamamoto importer Brian Bowdle claims the most noticeable and universally positive effects of the footers are to be found under mechanical source components. My own observations would support these findings. I've been using the ebony PB-10 footers under my Abbys for nearly two years and prefer their combined sound to the ebony-less Abby. 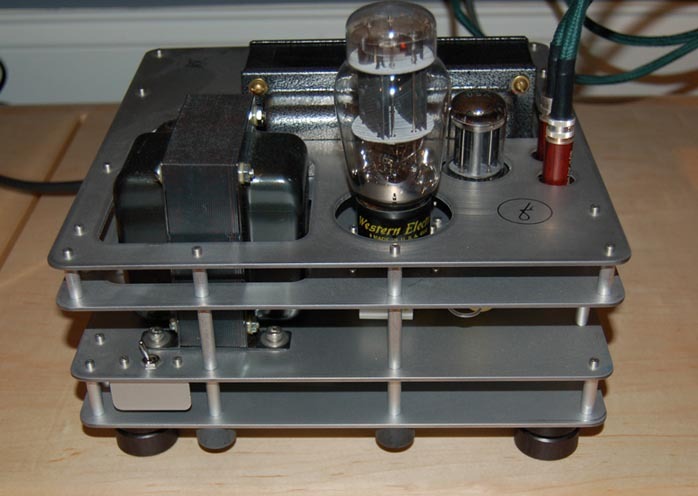 The changes imparted by the various footers to amplifiers and preamp were less dramatic and because of some of my Fis' somewhat unusual physical design, a bit awkward to get comfortably seated. But once situated, I found a clear preference for my Fi gear without footers. equal your results. Id' like to suggest that more traditional 'metal box with feet' equipment designs will respond more positively to the Yamamoto footers but I don't have enough variations on that theme to confidently make that assertion. Refreshingly, the Yamomoto audio bases are priced for what they are, not for what they're supposed to do. And this is an important distinction in the realm of the tweak. With pricing starting at $12.50 for four, the Yamamoto audio bases strike me as reasonably priced and lend themselves to relatively painless personal experimentation. If you're interested in shifting your systems' tonal flavor or in the case of the MGB-1 base also reducing floor-born vibration from entering your source, I'd recommend giving the Yamamoto audio bases a close look. You may just hit on a winning combination that will help your music move you more.